Lecture Hours: Tuesdays & Thursdays , 2:30 p.m. to 4:00.m. Lab Assistants: The following Lab assitants will be available during the week (names and schedules will be posted by the end of this week) for assistance on lab assignments. Rachel Newman: Wed 4-6p and Sunday 7-9p. On Feb 10, March 2, and April 13 the Sunday hours will be 6-8p. 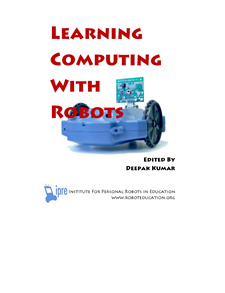 Learning Computing With Robots: by Deepak Kumar, Institute for Personal Robots in Education. Available at the Campus Bookstore. Python Software + IDLE + Myro (This software is already installed in the Computer Science Lab). The software is also available for your own computer from the CD included in your text. Scribbler Robot Kit: These will be handed out to you in Week#2. Chapter 2: Exercise 4 (Hand in the program). If possible, post a video of your robot's performance on YouTube (send link to me). Assignment#2 (Due on Thursday, february 14): Write a program for your Scribbler to draw a 5-point star. [Hint: Each vertex has an internal angle of 36 degrees]. Your program should include a function called, drawStar(sideLength), so that you can use it over and over again to draw stars of different sizes. Write a main program to use drawStar to draw at least 3 stars (use a loop) of different sizes (say sides of length 3-10 inches) on the same sheet of paper. In the spirit of Valentine's Day, can you write a program for your Scribbler to draw a heart? Alternately, write a program for your Scribbler to create some abstract art. Hand in the two programs, and sheets that show your robot's drawings. For the second program, try and be creative, include repetition, use different colors etc. HINT: For how to write general scribbler commands for turning a specific amount and traveling a specific distance, you may want to read the first 5 pages of Chapter 4. Assignment#3: (Due Tuesday, February26): Light follower: Write a program for your robot to follow a bright light. I.e, the robot goes towards the light. Extra Credit: Make a video of your robot's behavior and either send it to Deepak and/or post it on You Tube. Assignment#4 (Due Tuesday, March 4): Implement Braitenberg vehicles 1, 2a, and 2b as discussed in Chapter 6 of your text. Additionally, implement any one of the suggested vehicles/robot applications from Chapter 6 (Choose from: Refrigerator detective, burglar alarm, Hallway cruiser, follower, Timid, Indecisive, Paranoid). Hand in all the programs you wrote. Also, write a short (1-page) essay on designing insect-like behaviors based on the robots you designed. Extra Credit: Make a video of your robot's behaviors and either send it to Deepak and/or post it on You Tube. Assignment#5 is posted (Due on Thursday, April 3): Click here for details. Assignment#6 is posted (Due on Thursday, April 24): Click here for details. Robot Videos and other demos from out there! January 22: First class meeting. Overview of the course. Introduction to computing and robots. Do the class questionnaire. January 24: Introduction to the Scribbler robot. How the computer talks to and controls the robot: Bluetooth wireless, computer, Python, Myro. Making the connection. Basic Scribbler commands: naming the robot, movements, etc. Read: Chapter 1 from your text. Class List for CS110 is posted. Click here to view it. January 31: Recap of tuesday's lab. Scribbler movement commands. Writing new commands using Python functions. read: Chapter 2 from your text. February 5: Robots that dance and draw. Some demos (See links in Videos above). Structure of robot brain programs. Doing calculations with programs: numbers, values, assignment. Input statements. Basic repetition structures: timed, forever, and counting. Read: Chapter 3 from your text. February 7: Structure of Python programs. Repetition in Python. Examples of simple computations. February 12: Sensing from within: Procprioception in the Scribbler-battery, stall, and time sensing. Examples of behaviors using propriception. Loops with conditions: comparison operations and logical connetcives in Python. Read: Chapter 4 from your text. February 14: Sensing from within. Examples of conditionally droven loops. Parameters in functions re-visited. Generating random numbers and using them. Drawing random sized polygons. Experiments with speech generation. February 19 : Sensing the world: camera, light, and proximity. Writing reactive behaviors: making decisions in Python. Read: Chapter 5 from your text. February 21: Sensing light and obstacles. Functions that return values. Making decisions. Designing reactive behaviors. February 26: Designing insect-like behaviors. Braitenberg vehicles. Other examples: refridgerator detective, burglar alarm robot, etc. Read: Chapter 6 from your text. February 28: Doing computations: financial loans, guessing games. March 1: FYI: Princeton UDesign Conference this weekend (March 1) Click here for details. March 4: Doing computations: writing simple guessing games. Generating random numbers. Read: Chapter 7 from your text. March 6: Game programs continued... Introduction to Computer Graphics. Read: Chapter 8 from your text. March 18: Review for exam. More graphics. March 20: Exam 1 is today. March 25: Deepak will be out of town. March 27: Deepak will be out of town. April 3: File input/output. Towards drawing maps. April 8: Drawing maps. Visualizing data on maps: population, election results, etc. April 17: Algorithms & Problem solving. Core ideas in computing and problem solving. Read: Chapter 10 from your text. April 22: Special lecture by Keith O'Hara (GeorgiaTech/IPRE). April 24: Demo Day! Today you will demo your Assignment#6 to everyone. We will meet in the lab (Room 231). Also, that day, we will collect all the robot kits back. April 29: Course wrap up. Evaluations etc. May 1: Exam 2 is today. Created on January 18, 2008.